Baton Rouge, LA – August 4, 2017 – Lamar Advertising Company (Nasdaq: LAMR), a leading owner and operator of outdoor advertising and logo sign displays, today announced that it has acquired the assets of Steen Outdoor Advertising, significantly enhancing Lamar’s position in Philadelphia and the surrounding region. The all-cash acquisition adds more than 460 billboard faces, including 23 digital bulletin faces, to Lamar’s existing media footprint in the Northeast. Steen’s inventory is concentrated in Philadelphia and the surrounding Pennsylvania suburbs, with coverage extending into western New Jersey and Delaware. Steen, the largest independent provider of outdoor advertising in the Philadelphia region, is one of the oldest out-of-home advertising companies in the U.S., with roots dating to 1932. Lamar Advertising today announced that it has closed on its recent acquisition of eight airport advertising contracts from Corey Airport Services. 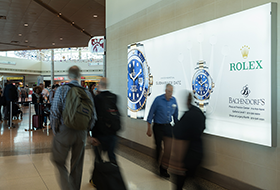 The acquisition adds a variety of traditional static displays, dynamic digital displays, wraps and clings, interactive exhibits and custom advertising displays in eight major airports, enhancing Lamar’s airport advertising portfolio in major cities across the U.S.